Growing up, we were very much the “sit down to dinner as a family and no TV” type of house. My mom cooked dinner nearly every night and we waited for my dad to get home from work, then we would sit at the table and eat together. Dinner usually consisted of a protein (chicken or beef), a starch (rice or baked potato), some type of vegetable (I always put up a fight) and a side salad. Surprisingly, I never fought the salad much, as long as I didn’t get any of the leaves near the inside of the head of lettuce. Outside, leafy lettuce only, please! For many years, I was only exposed to iceberg lettuce, until one fateful day when we had lunch at my grandparents’. My grandma served this salad as part of dinner. It was the first time I had ever eaten raw spinach and I, amazingly, loved it. Truth be told, it may have had as much, or more, to do with the bacon as it did with the spinach. Afterwards, my mom made it occasionally and I was always eager to eat it. To this day, if I make myself a salad at home or at a salad bar, I always prefer baby spinach to lettuce of any kind. This recipe was passed down from my great-grandmother and as far as I know the original ingredients were the spinach, bacon, onion and mushrooms. I always seemed to remember this salad with hard-boiled eggs and when I asked my mom, she said that she would often times add them when she made it. 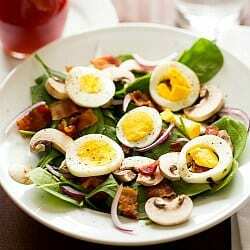 I love the inclusion of the eggs, as it adds some extra “oomph” to the salad. The warm dressing has a wonderful sweet and tangy flavor that pairs really well with all of the other ingredients. A wonderful spinach salad recipe with great ingredients and a warm, sweet and tangy dressing. Make the Dressing: Whisk together the dressing ingredients in a medium saucepan and cook over low heat for 1 hour, stirring occasionally. Let cool slightly and re-whisk before serving. 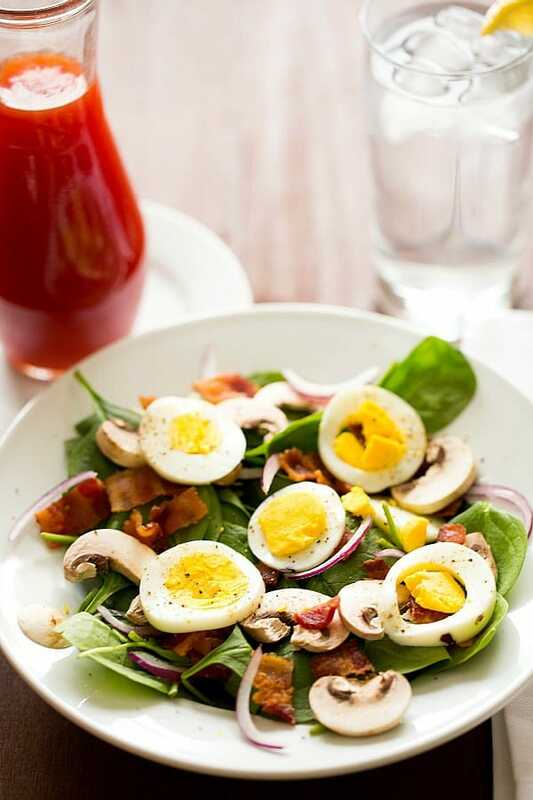 Arrange the spinach on plates and top with an equal amount of bacon, mushrooms, onion and sliced eggs. Sprinkle with salt and pepper, drizzle the warm dressing over top and serve. Any leftover dressing can be stored in an airtight container in the refrigerator. I am trying recipe for the spinach dressing right now and wonder if the ketchup you used is American style ketchup? Dressing tastes really sweet and Canadian ketchup is made with way more sugar than American and mlybe I should have reduced sugar to 1/4 cup instead or is this dressing supposed to taste like candy? Hi Veronica, I used Heinz ketchup sold in the U.S. It sounds like it could definitely be the problem, as this should be a tangy dressing, not super sweet. Original! looks delicious, I can not wait to try it, thank you. 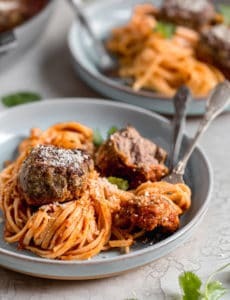 Looks delish and can’t wait to try it! Can you make the dressing the night before and just warm it up prior to serving?? An hour is too long on a weeknight!! Made this for a dinner party. Everyone delighted by it. The dressing is unique but adds a whole dimension to the salad. Thanks so much for sharing! Could I eat it also for the breakfast? Can this dressing be refrigerated for an encore serving? Making your own fruit salad is not hard; you just need to prepare its ingredients. And the ingredients used are neither extinct nor hard to find, you can just whip out your wallet and make the march to the nearest grocery store..
Mmmmmm! Love the eggs with ketchup based dressing! Besides the extra “oomph”, those eggs make you feel fuller. And that’s what every single salad should be like, isn’t it? Tasty, healthy(more or less) and satiating. Thanks for this delicious recipe. When I was a kid I hated spinach, but it’s been a couple of years since I started loving its taste and adding it to many dishes, so I’m happy to see that so many people are aware of its unique taste and value. I have to agree with the other readers, I’ve been eating this salad since I was a kid (with red onions added of course!) and/or cucumbers/tomatoes…it is a salad! But use 1 part bacon grease, 2 parts apple cider vinegar, a teaspoon of sugar and mustard seeds! Shake and serve warm, so good! This looks delicious. I have all those things in my fridge now. I love baby spinach and thankfully my kids will eat it too. I think I incorporate it at least once a week into some sort of dish— pastina soup, sautéed, creamed, wraps, in a pasta & of course in a salad. My dad used to make a wilted spinach salad similar to this, minus the ketchup, when we were growing up. I will try your dressing recipe but if I had the recipe for the Mellow Mushroom Esperanza dressing and this salad I would be in heaven! Right here is the Mellow Mushroom Salas Dressing! Spinach salad is one of my favorites and I must try the dressing. I LOVE this kind of salad, but I’m not going to lie… I would put a warm bacon vinaigrette with it :) I could say something smart about ‘continuity of flavors’ throughout the dish, but we all know it’s just because I’m a bacon hog! Nice crusty baguette, and I’m a happy girl with this as my dinner! Reminds me of the “Betty Salad” that a lady here in Monroe, Michigan made. I believe her last name was Timko and she worked at the Holiday Inn when they had a restaurant. The salad dressing is available in the grocery store which makes it easy for me to make. This recipe is definitely a keeper, makes a great lunch or a light supper. Thank you! 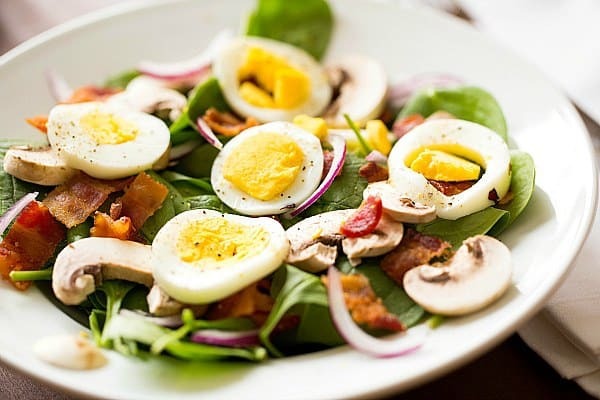 I love spinach salad with warm bacon dressing. 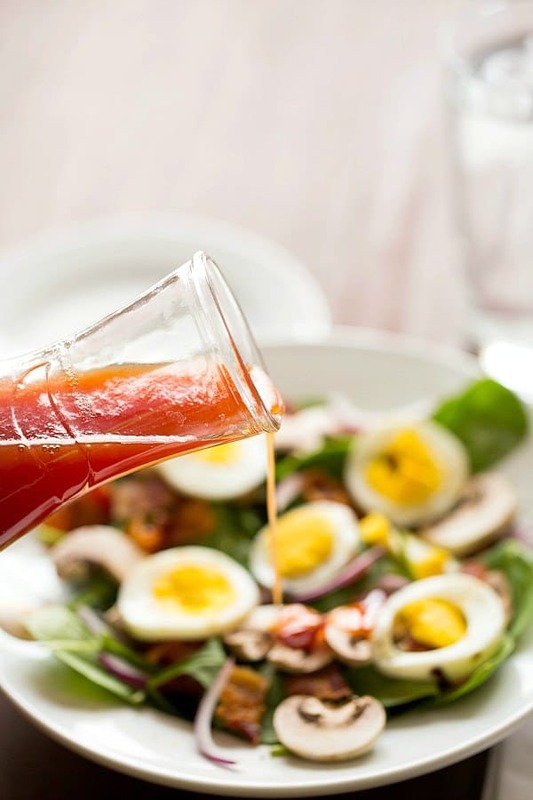 Have you ever tried making the dressing with the bacon and the bacon fat plus a little vinegar and mustard? That’s the only way I knew of to make this salad. Your dressing sounds very interesting. I’ll have to give it a try. Hi Laura, I haven’t tried the dressing like that, but it sounds fabulous! I will definitely try that on my next salad! What I want to know is how you got your eggs so pretty. My hard boiled eggs never look that good. I’ve finally learned how to not get the green / gray ring, but your yolks are much yellower than mine! 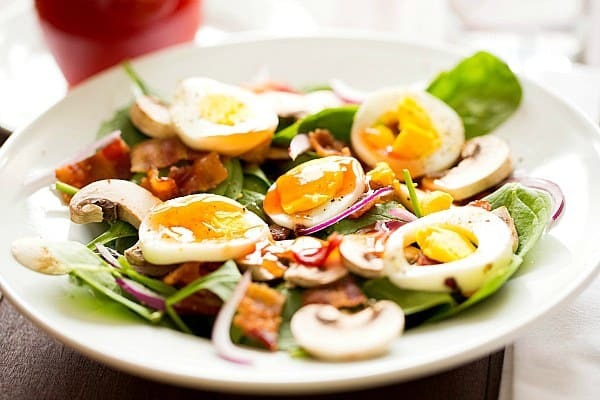 Beautiful salad, looks so fresh with sliced eggs on top! This looks delicious but, I didn’t know that you can actually eat raw mashrooms? Yes, you can eat raw button mushrooms. I know there are some wild mushrooms that you can’t eat, and can’t eat raw, but I don’t use wild mushrooms very often. Oh how I need this salad in my life! Geez, your site just keeps getting better and better. I want to take the photography class that you took! Delish! Aw, thank you Lori, you’re too sweet!